As I don’t pretend to impartiality, I’ll go ahead and say that my favorites are probably Fight On! and Knockspell, in terms of content that I find immediately useful. 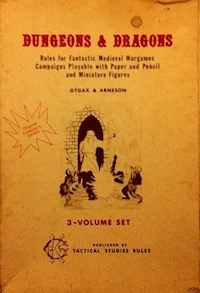 Associated with the OD&D Discussion board (“odd74”, focusing on the game from the 3 original “little brown books”). Creation is coordinated here. This pub is free, and comes from volunteer work done my members of the Dragonsfoot board. There is a useful download all link. This zine is associated with Swords & Wizardry, and edited by Matt Finch. A unique zine, print-only, and the work of a single author, Christian. Also includes content for some games that are not usually considered old school, such as White Wolf’s Vampire. Waiting for my first three issues to arrive in the mail, so I don’t have more to say yet. Another single author pub. NOD focuses on the author’s setting, but has lots of content that is generally useful. There are free samples. Decorated with lots of old public domain art that is very tastefully chosen. I haven’t had a chance to read my copies of this yet, but it looks promising. I love the visual style. Also has an associated blog. Interestingly, the author’s story seems similar to my own: “After a 15 year break from gaming two of my old friends met up with me last summer and we decided to start playing again”. For me, it was closer to 11 years. Byline: “A fanzine dedicated to the Classic D&D Game!”. Issues are free, and look professionally produced. Associated with Lamentations of the Flame Princess. In the words of James Raggi: “a print traditional gaming zine under the Green Devil Face name. It will have a more narrow focus than Fight On! or Knockspell, in that it will be specifically about individual dungeon rooms that feature obvious traps/hazards/puzzles that require players to experiment and reason through them instead of making a traps roll to detect/disarm them”. Associated with Goblinoid Games. Ashamed to say that I haven’t actually had time to check this out yet, despite the face that Labyrinth Lord is one of my favorite retro-clones. You can buy issues on RPGNow. I’m not sure if this is still active, as the most recent issue seems to be Vol. 1 Issue 5, from 2009. Byline: “The Original Dungeons & Dragons Fanzine”. Appears to be semi-defunct (I say semi- because on the blog, the author says he is working on a new zine, to be called Unknown Sagas, and which will focus on Swords & Wizardry). You can download issues 1 – 12 from Dragonsfoot, but newer issues seem to no longer be free. A&E is probably the oldest continuously published RPG periodical. It was started in 1975, and has been maintained by Lee Gold. I just learned about this in Fight On! 6, which also features a very interesting article by and interview with Lee Gold. The house magazine of TSR. Probably needs no introduction. Some reprints and PDFs are available from Paizo. There is also an online index, the Dragondex. The other house magazine of TSR, focusing on scenarios rather than rules and commentary. Like Dragon, some reprints and PDFs are available from Paizo. Original Judges Guild pub from the 70s. Pegasus is available from RPGNow. There is also a bundle of all 12 issues. I haven’t read very much of this yet, so not much more to say. Associated nouns: City State of the Invincible Overlord, Wilderlands of High Fantasy, Bob Bledsaw, Bill Owen, Tegel Manor. Clearly important in the context of the game’s history. Also see this thread on odd74 about the JG magazines. The TSR mag before dragon. Only had 7 issues, and also focused on wargaming. Unfortunately not legally available anywhere right now, as far as I can see. Completeness is not a quality that I aspire to in this post, as I want this to be an edited collection of resources I find useful. That being said, if you notice that I am egregiously ignoring something, please let me know so that I can investigate it. I don’t want to end up with a laundry list, however. Also, I know that this collection is biased towards the present. But then, isn’t everything? It is, after all, where we always live. This entry was posted in Uncategorized on October 4, 2011 by Necropraxis.